Yokohama is close to the center of Tokyo and easily accessible from there. The ocean is close, and the cityscape with a feeling of opening is recommended for sightseeing. This time, we picked up 6 events to be held in Yokohama. Yokohama has various events such as sports events that you can participate, contemporary art events, cultural experiences and nature experiences events. 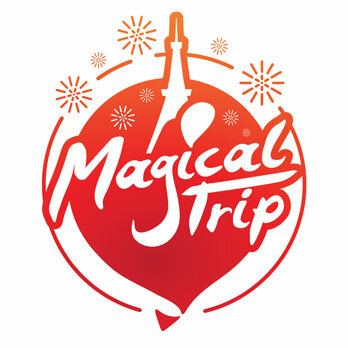 Why do not you enjoy sightseeing and some events in Yokohama? A marathon race will be held that allows you to enjoy the race with a refresh breeze in the Yokohama Bay Area. 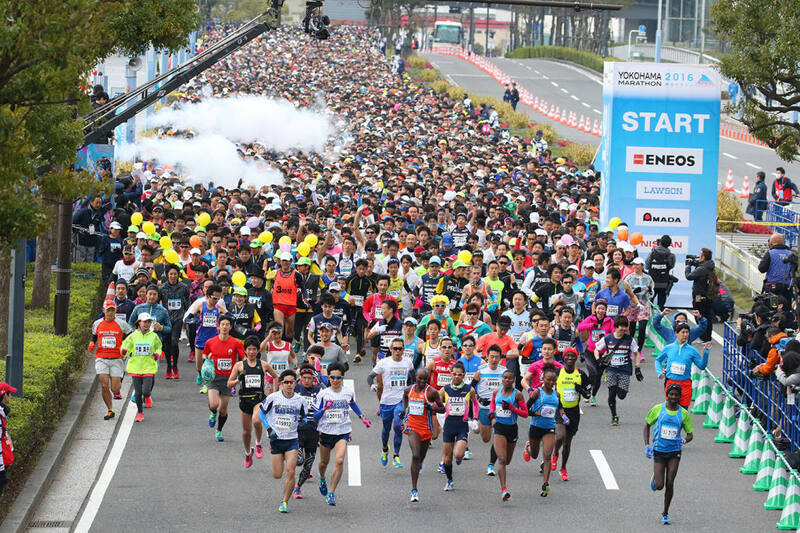 In 2017, 3,000 runners are added, and total 28,000 runners run through Yokohama in autumn. One of the features of this race is a part of the course is on the Capital highway. There are 4 types of races: full marathon (42.195 km), 1/7 full marathon (6.0278 km), 1/7 full marathon (wheel chair), 2 km (wheelchair). There are some sightseeing spots such as Red Brick Warehouses and Chinatown near the main venue, so runners and audience can enjoy a stroll in the port town after the race. Entry has already closed, but viewing is free. Also, at each water supply station, the support performance will be held with the concept of “cheer up runners”, so it may be fun to watch it. Although there are traffic restrictions on the day, you will see Yokohama which is different from the usual one. Let’s meet in Yokohama with a day of energetic inspiration. 1-1-1, Minato-Mirai, Nishi-ku, Yokohama-city, Kanagawa Pre. “Yokohama Triennale” is an international exhibition of contemporary art that is held in Yokohama City every three years. The sixth “Yokohama Triennale 2017” will be held this year. The title “Island, Constellation, and Galapagos” is also a keyword used in various ways of understanding such as isolation, connectivity, imagination, indicators, identity and diversity. What kind of possibilities can be developed by human courage, imagination and creativity in a complex era in which the future is invisible? Thinking with many people, it is aimed to disseminate new perspectives from Yokohama, the place of opening country and opening ports. Various workshops will be opened as well. In October, Kinoshita Susumu pencil drawing workshop will be held. The main venue is Yokohama Museum of Art. The other venues are Yokohama Red Brick Warehouse No. 1 and Yokohama Port Opening Memorial Hall basement. It is an opportunity to touch contemporary art in Japan together with sightseeing in Yokohama. Why do not you visit on this occasion once in three years? Your sensibility may be polished. 3-4-1, Minato-Mirai, Nishi-ku, Yokohama-city, Kanagawa Pre. Fantastic video that transforms “Enosui” into outer space and beautiful original music like gathering stars and knitting them invites spectators to an unknown exciting experience. 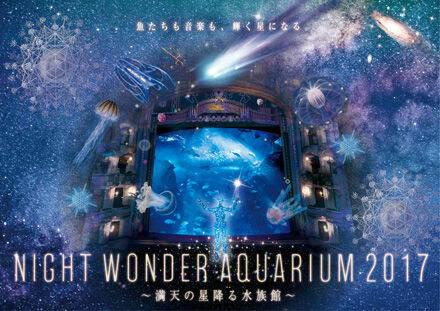 “Night wonder aquarium” is a special event from 5 pm, so it’s nice to be able to enjoy it with only entrance fee. The site of Enoshima Aquarium is in a great location with Mt. Fuji in the west, Sagami Bay in the front and scenic spot · Enoshima. It is a popular sightseeing spot regardless of generations as an edutainment type aquarium that we can learn while playing, as well as observing living things and specimens. There are also many attractive areas such as “Sagami Bay Large Tank” where the hordes of 8,000 sardines swim swaying and “Jellyfish Fantasy Hall”, show stadium where dolphins, whales and sea lions compete, beach experiential learning hall and so on. It is likely to be able to enjoy the expression of the aquarium different from the daytime by the event. 2-19-1, Katase-Kaigan, Fujisawa-city, Kanagawa Pre. ”NIGHT WONDER AQUARIUM 2017” is the special event which starts from 5pm, and you can enter with only the entrance fee. Japan Flower Designers Association (NFD) was founded in 1967 and approved by the Ministry of Education, Culture, Sports, Science and Technology in 1969. In 2010, it was certified as only Public Interest Incorporated Association of the flower designer organization from the Cabinet Office. Their purpose is to promote and disseminate flower design and to contribute to the improvement of Japanese life culture. They also certify and register the flower design qualifications. 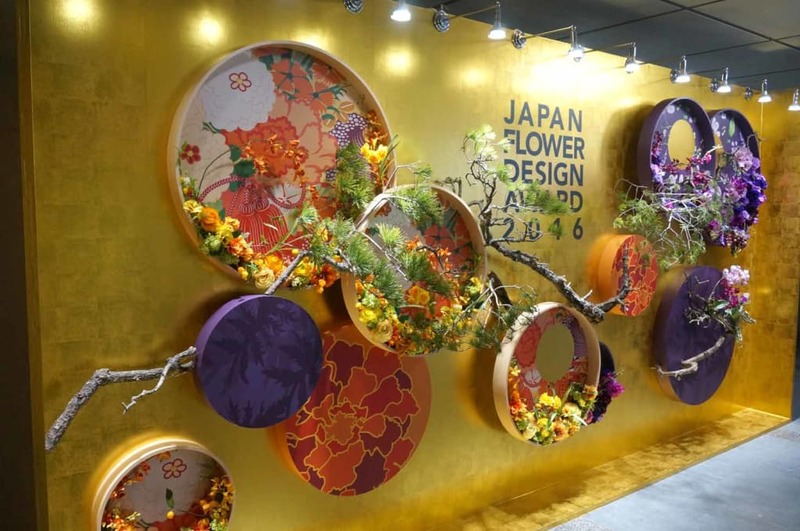 Japan Flower Designers Association will celebrate its 50th year this year. “Japan Flower Design Award 2017” is the event to decide the best flower designer in Japan with the theme of “Hyakka-Ryoran”. At the venue, gorgeous works with flowers blooming are displayed, and you can spend the healing time by flowers and plants. On the 1st of October, “13th NFD National High School Flower Design Contest” will be held inside the hall. Kurihama flower park is a city park in Yokosuka city and holds Poppy and Cosmos Festival every season. In the park, there are various facilities including herb garden, park golf course, archery field and so on. It has Perry Park which displays historical materials of Perry’s flight as well. 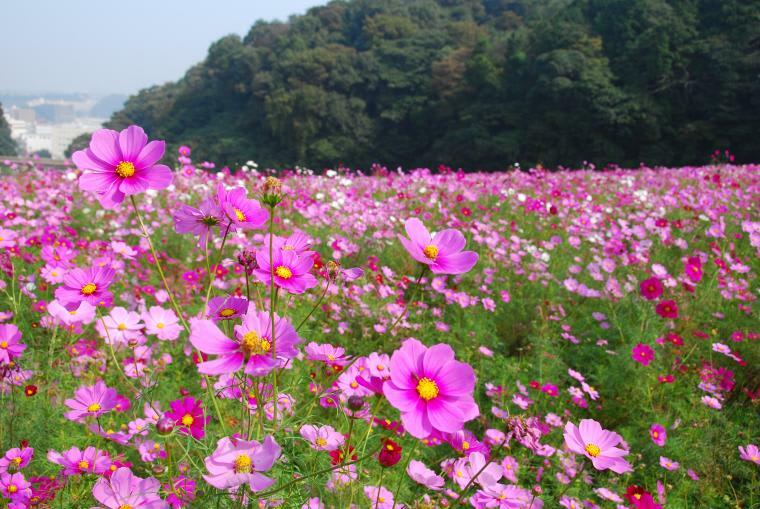 Cosmos Festival will be held in Kurihama flower park in Autumn. One million cosmos blooming in the cosmos garden have various varieties. In mid-October, they create a beautiful landscape. During Cosmos Festival, various events are also held such as performance show, photograph contest and “Senryu” contest. On October 30th, you can join ‘free flower picking’ and pick flowers as you want. You should be able to spend a peaceful time surrounded by flowers, nature and wind. The park has two restaurants with the wonderful ocean view. At the garden restaurant “ROSMARINUS”, you can enjoy dishes using various herbs. At “Tenku BBQ”, you can taste the delicious seafood BBQ. Enjoy flowers and meals altogether! 1, Shinmeicho, Yokosuka-city, Kanagawa Pre. In 2019, it is 500 years after the death of Leonardo da Vinci. 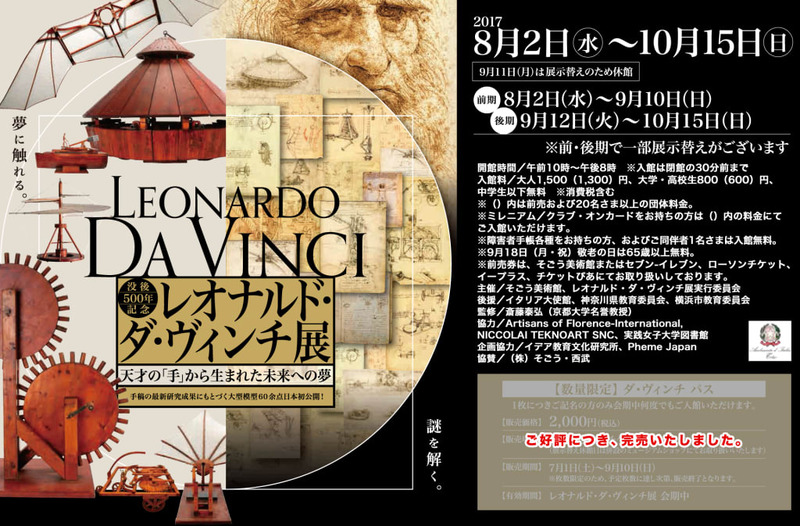 500th-year memorial ”Leonardo da Vinci” Exhibition are held in Sogo museum. Although Da Vinci left not only famous paintings like Mona Lisa and Last Supper, but huge handwritten memos. Their contents are inculiding mechanical engineering, aerodynamics, astronomy, geometry, architecture, anatomy and so on. With the cooperation of Studio in Florence “Artisans of Florence” which produced a model based on the latest research results of Da Vinci’s manuscript, about 60 large models invented by Da Vinci will be exhibited this time: one of the most famous inventions “spring-loaded car”, “Glider”, “Air screw”, “Robot drummer” and so on. Not only the models but also Da Vinci’s memo which are the source of the models are interesting. Through exhibited works, you can experience Da Vinci ‘s observability, imagination and realization power. In addition, photograph shooting is also possible at the venue. It seems fun to take photos with a large model invented by Da Vinci. Let’s feel genius Leonardo da Vinci’s talent. 2-18-1, Takashima, Nishi-ku, Yokohama-city, Kanagawa Pre.